Garage door openers offer safety, security and convenience in using your door. These are motorized devices installed together with your door, and operated by using wall switches or remote controls. Contrary to what most of us know, door openers do not provide the actual power that lifts a heavy door. The lifting power is generated by the garage door springs that are also attached to the door. The opener is the one that provides a small force that controls the reach of the door as it opens or closes. It may also hold it in place. There are three main types of door openers based on drive system. These are the belt-driven, chain-driven and screw-driven openers. Belt drive garage door openers use rubber belts to open doors. It is the quietest option among the three because there is no metal-to-metal contact. However, it may be more expensive but it has fewer moving parts, probably requiring lesser maintenance. The second type, which is the chain drive system, uses a chain to open the door. This chain is attached to a trolley, making it noisier compared to the belt system. You can look for openers that hide the chain for a reduced noise. This type is common, more economical and yet dependable. Lastly, the screw drive type also has fewer moving parts and uses threaded steel rod to open the door. This is quieter than chain-driven types especially because of the plastic-lined tracks. Your first buying consideration in buying an opener or garage door motor is the appropriate power you need for your door. Since garage doors vary in weight, you need the right opener horsepower. If you are using a heavy residential door, you might need a ¾ horsepower. A standard door may be opened by a ½ horsepower, while a heavy one may require up to 1 and ¼ horsepower. Larger motors are a good option even for a single car garage for they can last longer. Aside from power, you may have to choose the safety and convenience features. Today’s models are equipped with safety reversal systems that stop the door when an obstruction is detected. You may also have to choose between wall-mounted or remote controls, and one-button or multiple-button controls. 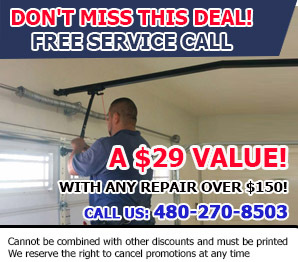 Specialists at garage door repair Mesa emphasize the importance of understanding your options so you can select the best one for your home.